Cindy Zlotnik Oravecz of Quilter’s Fancy created this beginner’s guide and it remains our best-selling flower making book! You will learn to make more than 20 three-dimensional flowers from fabric or ribbon with Cindy’s “faster by the strip” method. Learn to create baskets with French wire ribbon, wreaths and meandering vines. There are also more than thirty realistic leaves included for appliqué. Dimensional flowers found in the book include pansies, old-fashioned roses, Cherokee rose, hollyhock, peony, buttercup, primrose, begonia, violet, viola, iris, fuchsia, roses, bleeding heart, bluebells, Canterbury bells, windflower, lily-of-the-valley, hepatica and ruched chrysanthemums and well as a dimensional butterfly, leaves, buds and stamens. Instructions include eight quilt blocks plus two half blocks to make a dimensional flower album quilt. This book uses The Ruching Edge tool, and we highly recommend it to make your ruching life easier. 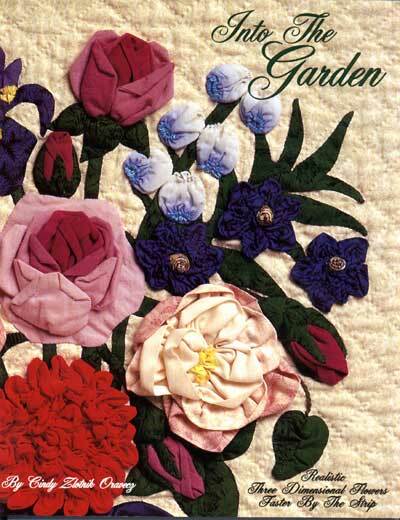 The three-dimensional flowers in this book are not like flowers found on traditional Album Quilts. The flowers on album quilts from the mid 19th century are "stylized," which means the designs represent typical patterns from that time and not necessarily the way flowers actually look. My dream has always been to create flower-based album quilts in the same fine tradition of expert needle skill with imaginative use of high quality fabric and fibers. But rather than stylized flowers, I want dimensional flowers that are so realistic and beautiful they stand apart. That is what this book will bring to you. My techniques also are different because they make creating an Album Quilt faster. The ornate Album Quilts of the 1840s and 1850s were created in a time different from our lives today. A single block could take 40 to 60 hours of sewing and cutting. The patterns in this book were designed to save time. Flowers bend, move and have wobbly edges. 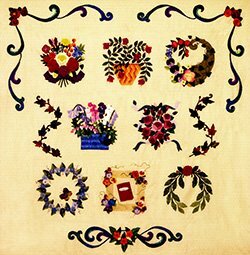 Arrange your flowers to blow and bend to your liking, for if you look through history, individualism in a quilt is what makes it notable.